Happy Monday, Have Some Toast | OhGizmo! While you’re groggily trying to make yourself breakfast in the morning, there’s nothing like the glare of over 200 Swarovski (i.e. fake) crystals to help jump-start your circadian rhythm. 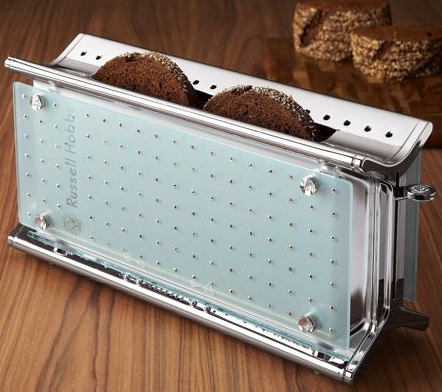 The rest of the (fairly ordinary) toaster is made of stainless steel and frosted glass, and one of the limited edition of 500 can be yours for a mere $300. That’s right, folks. 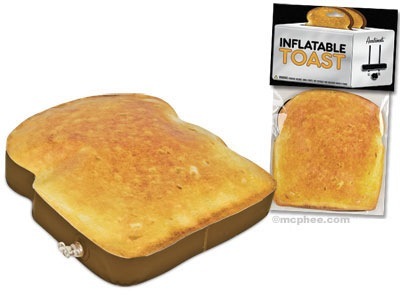 It’s finally here… Inflatable toast! Now you don’t have to worry about actually buying bread for toast ever again. Simply inflate the toast with some nice hot air, enjoy*, and when you’re finished, deflate until you get hungry again. You get two (two!) slices of inflatable toast for just $6.50. *If Steven K. Galson were here, I imagine he’d say that if you actually try and eat a piece of inflatable toast, you probably deserve to choke on the vinyl it’s made of. When you say “fake”, to what are you referring? All crystal is made of glass and Swarovski is about the best in the world. Bah, how backward. I want SELF-INFLATING toast. I’m pretty sure that Swarovski crystals are cut glass, and glass is an amorphous solid, which is kinda the opposite of a crystal. Crap, some of my geology education HAS rubbed off on me!